Since 2005, Anderson Valley has celebrated its Alsatian roots with the , affectionately known as AlsaceFest, paying homage to the always intriguing aromas and flavors associated with varieties like Pinot Gris, Riesling, Gewürztraminer, Pinot Blanc and Muscat. It’s such fun to discover familiar wineries trying their hand at these grapes for the first time, embracing their steely perfuminess and acid-laden qualities. This year, Handley Cellars had by far the most impressive lineup across the board with their 2015s. This might have been a tough vintage for some, but in the hands of the Handley team, their vineyard sources enabled them to produce some of their best wines ever. It was great to see Milla’s daughter, Lulu, in attendance. From Anderson Valley to New Zealand, from Santa Barbara to Michigan, from the Santa Lucia Highlands to the Rogue Valley of Oregon, we tasted a bevvy of brightly singing and exciting Alsatians, and thanked the winegrowers who refused to abandon ship on these aromatic ancestors when the tide turned to Chardonnay. We did miss entries from Bink, Elke and REIN this year, but in their stead, welcomed Claiborne & Churchill, Cutrozzola, Foris, Reeve, Stony Hill, Tatomer and Waxwing. 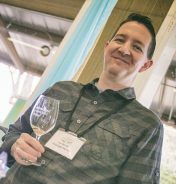 One of the absolute highlights of the experience was made possible by winemaker Joe Webb of Foursight, who poured a vertical of Gewürztraminer made under the now discontinued Londer label (for which he once served as winemaker). This walk down memory line was riveting in its revelation of this oh so captivating grape. 2014 Cutruzzola Vineyards Riesling, San Luis Obispo – From a vineyard in Cambria comes this well-made very dry (1%), pure lime and Meyer lemon wine that delivers limestone slickness, along with significant weight on the palate, accompanied by honeyed overtones. Significant ageability is built in here, and the 2012 off-dry (2.3%) indicated just how nicely these wines can develop. 2015 FEL Pinot Gris, Anderson Valley – Two vineyards provided the fruit for this ultra-summery fruit-dominant, richly intense in the mouth Pinot Gris: the Wiley Vineyard near the town of Navarro, and Donnelly Creek Vineyard located near the town of Boonville. Picked at around 23.8 brix, the wine was taken from lots fermented in a 900 gallon French oak oval tank (30%), small neutral French oak barrels with four months of sur lie aging (30%), and stainless steel tanks (40%). You can really feel the oiliness of wood and sur lie aging, as it boosts the honeydew, quince and ripe Asian pear flavors to a new level. A definite hit of honey shows up on the finish. 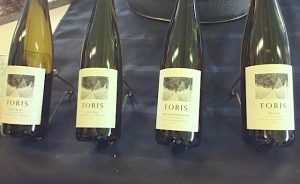 2015 Foris Gewürztraminer, Rogue Valley, Oregon – All the wines from this well-rooted winery that claims it’s the southernmost in Oregon, are worth exploring, and exceedingly affordable. Each is a solid rendering of the varietal, showing winemaker Bryan Wilson’s grasp of the terroir. He’s handing over the reins of this 255-acre vineyard to Stephanie Powell (Saintsbury, Bethel Heights). Greeting you with rose petals and perfume, this GW is spritely as a wood nymph, dancing with white nectarine and melon and significant, pleasing weight. We loved the 2015 Pinot Gris, but it’s sold out, as is the Riesling. Owner Ted Gerber, who bought the property in 1971, assures me the 2016’s are being bottled as we speak, and are just as awesome. 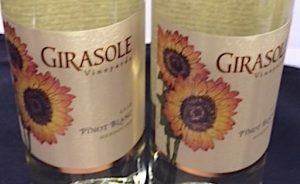 2016 Girasole Pinot Blanc, Mendocino – Dripping with fresh nectarine and lime zest, this generously textured, full throttle fruity wine has the decadent and plush texture that most Chardonnays long for but never achieve. Pure ripe peach pleasure on the palate. Made by Barra of Mendocino. Oh, so affordable, too, at $15. 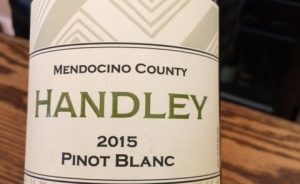 2015 Handley Pinot Gris Anderson Valley – It’s almost impossible to choose between the 2014 Gewurztraminer, 2015 Riesling, 2015 Pinot Gris and 2015 Pinot Blanc, so the best plan is to get one of each. The Gewurz oozes orange peel, cinnamon and cardamom spice, the Riesling is charm itself, while the Blanc is creamy and rich, with beautiful peach notes. Of the lot, though, the Gris is the true crowd pleaser. Sensationally lively and bright, it delivers mouthwatering white nectarines, peach, lime zest, tangerine and grapefruit pith. This is Randy’s best Pinot Gris to date. 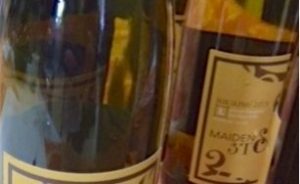 2015 Maidenstoen Riesling, Santa Rita Hills – There’s no doubt Mike Callahan is completely committed Riesling. He seeks out special sites that offer unique slants on the grape, and this year, shared wines from Tondre Grapefields in the SLH, Zabala in Arroyo Seco and Santa Rita Hills. Typically, he leaves about .2% RS to balance out the ziplining acidity. This one pops with grapefruit and burnt lime peel, then shreds across your palate like a snowboarder on speed, heading for a zippy finish that cracks a few green peppercorns and a hint of juniper. This is a sensational wine. The Zabala is much prettier, with lots of rose petals and lilac, while the Tondre surges with orange peel, honeysuckle and lime blossom and finishes with beeswax. 2015 Philips Hill Gewürztraminer, Anderson Valley – A first time effort from Valley Foothills Vineyard managed by Casey Hartlip, this is right on, showing great grip, juicy white peach, delicate cardamom and hints of blood orange. The 2015 Philips Hill Riesling from Greenwood Ridge is just as good as when we sampled it out of tank last year: still precisely hitting all the notes in the upper register. Beautiful label art, too. 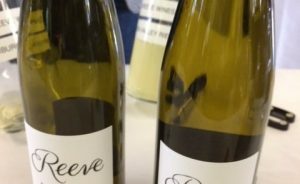 2015 Reeve Riesling, McFadden Vineyard, Potter Valley – From this certified organic vineyard high in the Potter Valley of Mendocino, comes an impressive debut, with aromas of lime zest, lyche e and crisp apple that translate to the palate, adding guava and striking blood orange zest. This wine did not undergo malo, preserving its tidy acidity. 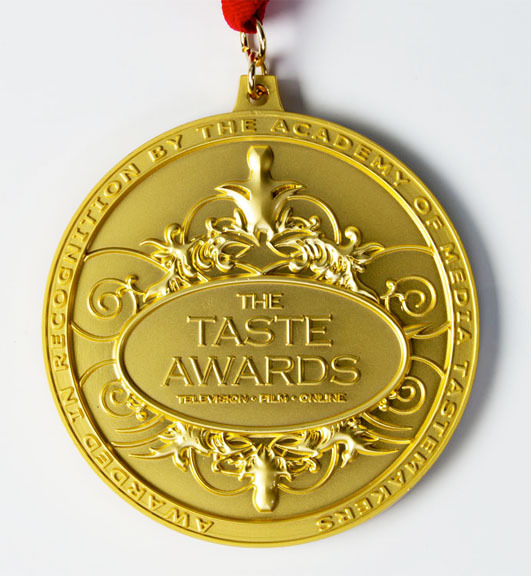 2014 Tatomer Riesling Vandenberg, Santa Barbara County – Graham Tatomer has a fondness for aromatic whites and is especially keen on Riesling, because of its stunning ability to carry off nuanced, yet pronounced flavors along with its bracing acidity. And then, there’s its aging potential. He shared a vertical of Kick-In Vineyard 2011 through 2008, with the latter being the utter stunner of the day: superb petrol, wildflowers, slate and white peach cobbler. Proof that his super cool vineyard sites, two near Vandenberg Air Force base, and two near the Santa Ynez river, have what it takes to go the distance. 2016 Toulouse Gewürztraminer, Anderson Valley – The entire aromatic lineup from this ebullient local producer with the loose goose on the label, is worth checking out, but this Gewürztraminer, from Valley Foothills Vineyard in Anderson Valley, rings the chimes the loudest with is enormous aromatics of zesty lime and ginger, along with flavors of lemon meringue pie and a nice sprinkle of cardamom. 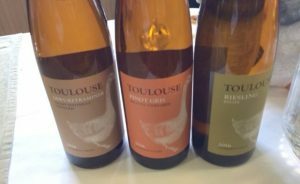 The Toulouse Pinot Gris is gorgeous, too, with unctuous lavender, guava and honey. Mark your calendars for next year’s event and get on the Anderson Valley Winegrower’s mailing list now, so you don’t miss the Pinot Festival coming up. Laura Ness, aka “Her VineNess,” is an accomplished wine journalist and wine critic whose passion for wine was ignited by a visit to France, where she had the unmatched pleasure of tasting Sancerre in the medieval town of Sancerre – splendid!— and then a Saumur, after visiting the Chateau de Saumur in Chinon. The concept of terroir came alive in those incandescent moments. 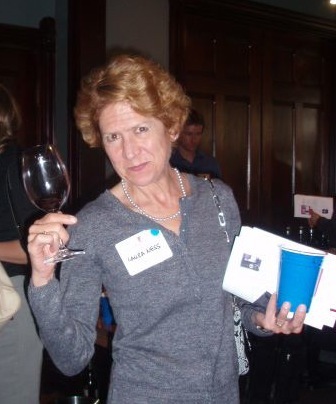 She regularly judges wine competitions and serves on the tasting panels of the Pinot, Cabernet and Chardonnay Shootouts. 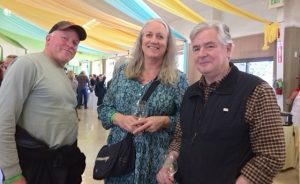 She was instrumental in helping define the unique sub-regions of the Santa Cruz Mountains AVA in concert with Appellation America. You can usually find her sipping and smiling in Mendocino, Livermore, the Santa Lucia Highlands, Santa Cruz Mountains and Paso Robles. Laura writes extensively for many industry and consumer publications, and has weekly wine columns in several Bay Area newspapers. She blogs, irreverently and sporadically, at myvinespace.com.